Chess for Networks is suitable not only for schools, but also for chess clubs, trainers etc. that offer chess training to one or more groups or classes of students. The system can handle any number of students, classes and trainers. Training classes can be conducted on a local network or over the internet. The system keeps track of the results of each student all the way down individual exercises. Chess for Networks is therefore very different from training programs intended for individual chess players who practice on their own without guidance from a trainer. Due to the complexity of Chess for Networks I will use this article as a general introduction to the system, but next month I will look in detail at some of the more interesting functions, or perhaps I should rather say processes, supported by the system. Chess for Networks offers all the tools and functions needed to set up and run organized chess training for smaller or larger groups. Naturally this requires a difference approach when compared to traditional training software. The server is the central piece of the system that ties the other components together. It holds all the information about trainers, students and their current status, historical information about each student and a database of theoretical training material and exercises. 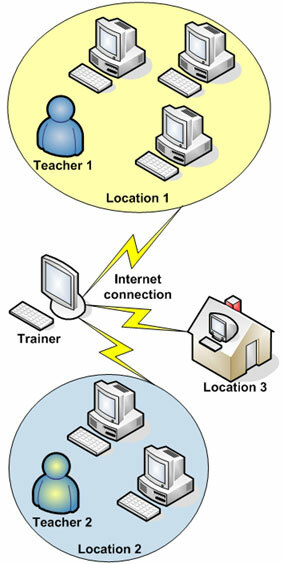 The server also controls the interaction between trainers and students, e.g. during classes, tests, lectures and seminars. It allows the students to play matches and tournaments and keeps track of the results. New trainers can only be registered by the server administrator. Even though the server is technically the most important part of the system, it is not very interesting from a user’s point of view. Trainers and students only use it indirectly through their respective clients. The trainers access Chess for Networks through a special module (or client) which gives them an impressive set of training and administrative tools. The student’s module allows students to study the training material assigned by the trainer, solve exercises, take tests, watch (or listen to) lectures, participate in seminars, play games of chess and participate in tournaments along with other students etc. Students can also communicate with the trainer, who in turn can assist them if they run into problems. The off-line student’s module is intended for homework and allows students to practice and work on their assignments even if they don’t have access to the Chess for Networks server. The image below illustrates how the different components of Chess for Networks work together. Each computer displayed in the image, except the server and the trainers’ computers, is a student’s computer. When at home (the three houses at the top of the image) the students can work on their assignments, which may contain both theoretical material and exercises which they must complete and return when the class meets again. The dotted lines indicate that there may not be a network connection between the homes of the students and the school. In that case the home assignments are transferred on portable media (USB flash drive, floppy disk etc.) and imported into the off-line student’s module. After finishing the assignment it can be exported again and brought to school where it is imported into the Chess for Networks server database. 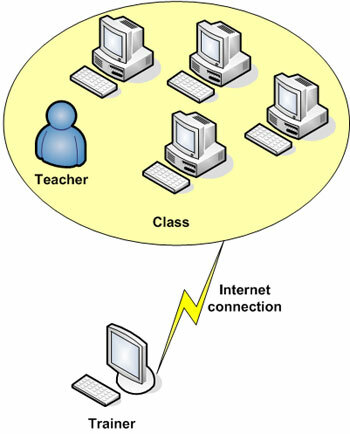 During classes all the students and the trainers must be connected to the server, either through the local network (as shown here) or through the internet. 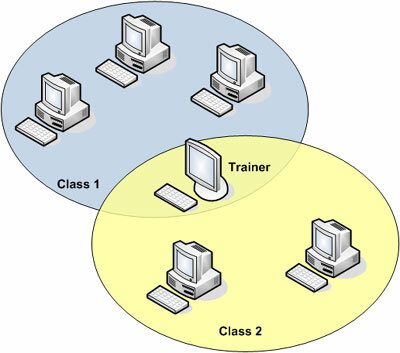 The image shows two classes being run in parallel (class 1 and class 2), each with its own trainer (trainer 1 and trainer 2). If there are few students in some of the classes the same trainer can easily handle two classes at the same time, even if they are not at the same stage in the training. This is illustrated in the next image. Grandmaster Yuri Razuvaev mentions another possible arrangement for conducting the training in an interview on ChessOK.com. He calls it two-level teaching. In this setup a teacher is physically present in the classroom with the children. He is not necessarily an experienced trainer, but helps the students with any minor technical problems that may arise and generally makes sure that the children can fully focus on the training. The chess trainer on the other hand connects remotely from his home or office. Using Chess for Networks he can deliver lessons, explain new training material etc. and most importantly, communicate with the children. In many areas it’s hard to find a good local trainer. Using Chess for Networks, even students in remote locations can take advantage of the best training available from experienced trainers. This is very important for many countries and areas where there is a lack of good trainers. Conducting the training over the internet makes better use of the trainer’s time as he doesn’t have to travel long distances to visit all the schools. This means that he has more time for what he does best, i.e. chess training. The same trainer can simultaneously train students in different locations. He can create classes in Chess for Networks, regardless each student’s location. Students will always be a part of a larger group where everyone is at a similar level, allowing them to attend classes, follow lectures, play and talk to each other through Chess for Networks. Clearly, aspiring chess players will enjoy such company much more than learning on their own. The image below illustrates this “multi-location” setup. Here we see one trainer handling students in three different locations as a single class. All students connect to the Chess for Networks server through the internet. In locations 1 and 2 there is a teacher present, but location 3 shows a student participating in the training session from his home. Regardless of whether the trainer is physically present in the class or not, the biggest advantage over traditional methods is that every student’s solutions are saved to the server. This allows the trainer to get a clear view of the progress of the students and take each student’s knowledge and skill into account in preparations for the following sessions. Creating the chess school is as simple as installing the server software. All the training material that comes with Chess for Networks is stored on the school server where it can be accessed by the trainers. Creating the chess school also installs all the software for the trainers. Accounts for the trainers are created on the server, but besides that the server can be pretty much left alone working in the background. Just make sure that it is up and running when it’s needed. Training material prepared by grandmaster Yuri Razuvaev, chairman of the FIDE Trainers’ Committee, and other Russian coaches. Over 3000 theoretical examples and exercises organized into 150 lessons. A first year education plan. Assuming that the students start as total beginners, the training material and methods provided by Chess for Networks should cover 2-3 years worth of chess training. The trainer can supplement the provided training material with his own lessons and assignments. The trainer has full control over registration of students. He can create classes based on the student’s abilities or other criteria. Groups of students can be formed within a class. The trainer can browse statistics for individual students, groups and classes. The trainer can observe each student while he is solving exercises, discuss with him and offer hints, if needed. He can even analyze with a built-in chess engine when discussing positions and variations with students. The trainer can assign homework to students, even at scheduled times in the future. He can monitor the progress of each student, review their solutions and add his own notes to their solutions, e.g. pointing out where a student went wrong. The trainer can organize chess games between the students, whole tournaments or simultaneous games. Like other functions of Chess for Networks, games can be played on a local network or over the internet. The student can follow the lectures of the trainer on a chessboard displayed on the screen, as well as verbal commentary and variations. The trainer can use graphical markers on the chessboard to illustrate ideas. The student can participate in seminars where the trainer and students discuss theory, examine positions and analyze games. The whole dialog between the participants is visible to all students. The students can work independently on their assignments. When solving exercises they can take advantage of a built-in system offering hints if necessary. The students can play chess against each other and participate in tournaments on the local area network of the school or over the internet. The student can work on his assignments in the classroom or at home using the off-line version of the student’s module. In this article we have taken a high-level look at Chess for Networks. Next month we will examine some of the most interesting parts of the system in more detail. In this article we continue our look at Chess for Networks, a software system for administering a chess school or course under the guidance of a trainer. Last month I mentioned that Chess for Networks is suitable for anyone that provides chess training: schools, clubs and individual trainers included. I should add that countries that are really serious about introducing chess in schools might consider following Slovenia’s example. Slovenia is country with a strong chess tradition and they have selected Chess for Networks for training young students in all their schools. Last month’s article was a general introduction to Chess for Networks. This month I will look at some of the general features of the user interface and the process used for assigning lessons to students and how students complete the lessons. The user interface of Chess for Networks is very flexible and you can reorganize the workspace as you see fit. You can even stack windows on top of each other, causing selectable tabs to appear beneath the windows. Windows can also be “floated.” A floated window can be placed outside the application window, and even on a different monitor which can be useful, e.g. for demonstration purposes. Students. This mode is used for student management such as adding new students and grouping them into classes. The trainer also has access to statistics about the performance of each student and class. He can also communicate with a class as a whole or individual students in the students mode. Lessons. Here the trainer sees a list of all available courses and lessons. He can see the current status of each group and how each student has performed in each lesson. View lesson allows the trainer to view the training material in detail. It consists of several courses an each course has several lessons. Finally each lesson consists of multiple exercises. Here the trainer can also examine an exercise with selected students or classes. Statistics. The trainer’s module comes with predefined statistics to choose from, but custom queries can also be defined for statistics on students, classes, courses, lessons or tasks. Playing room is for playing games between students or students and trainer. Tournaments. The trainer can organize different types of tournaments and matches between the students, with or without his own participation. In the screenshot above the lessons mode is selected and below the mode buttons there is a list of windows that are available in this mode. These are called mode windows. Four of those windows are currently displayed in the workspace to the right of the mode buttons. The lessons, playing room and tournament modes are also available in the student’s module. The trainer registers students and creates the classes or groups using the class management window shown below. This window has two sections. The group (or class) section on the left lists all groups that have been defined. It shows the group name, a description of the group and the number of students in each group. The “All users” group is created automatically. On the right hand side there is a list of students that belong to the group highlighted on the left. In this case the “All users” group is highlighted so all the students are listed in the “Name” column. There are four buttons at the bottom of the window. New user is used to create a new user account and add it directly to the highlighted group. New group creates a new group or class. If you highlight a user in the “Name” column and then click Delete user the highlighted user will be deleted. After creating the required groups and registering the students simply click on a student’s name and drag into the correct group. If you make a mistake and put a student into the wrong group, just put him into the correct one and he will automatically be removed from the previous group. After the students have been registered and split into groups, the training can start! Let’s assume that we are starting out with the “Beginners” class that we saw on the screenshot above. We want to distribute the first lesson to all the students in the class. So we click on the Lessons button in the navigation pane and select the “Beginners” class in the “Groups” windows. The group info window will be updated to display information about the class. Sending the first lesson to the beginners’ class is as easy as clicking on the Send link in this window. But before we do that let’s have a closer look at what it is showing us. First there is a list of the four students in this class. Since the class is just about to start there is no information available about each student. The lower half of the window shows that this is the “Beginners” group and their first course is the rules of chess. The first classroom lesson will be about the chessboard. It is a theoretical lesson, meaning that there are no exercises to solve. No homework has been assigned to the group. Now let’s click on the Send link (there is also a toolbar button that server the same purpose). The “Send lesson” window is displayed. Starting at the top of this window we see a very useful option: “Specify time to send”. Let’s say that the trainer wants to send a new homework package to the students next weekend. Even if he is nowhere near a computer at that time he can schedule that package to be sent out automatically by specifying the time when it should be sent. In the next line we see that this lesson will be covered in the classroom and the students are also expected to work on it at home. The lower part of the screenshot is divided into two lists “Send to” on the left and “Available users and groups” on the right. We see that the trainer wants to send the lesson to all the students as the “Beginners” group is in the “Send to.” The arrow keys between the lists can be used to move items between them. This means that a lesson can be sent to only selected students. A student would normally click on either “Open contents” or “Start solving” in order to follow the lesson or start solving the exercises. There is a special student’s module in Chess for Networks which, as the name indicates, is used by students to attend classes, solve exercises, play games, chat with the trainer or other students etc. Having received a new lesson and opened it the student’s module will display it as shown on the image. There are currently five windows displayed in the workspace. Let’s start at the top left with the “Task” window. It explains in simple words what that student is expected to do, in this case read the text provided with the current example. After completing a task this window also shows you if you were successful or not. Below that we see the board window, which displays the chessboard. At the top right we see the clock window. It shows that we are currently looking at example 4 of the current lesson. The clock is a countdown clock which starts with the estimated time needed to complete this step. The all important notation window is below the clock window. It is used to show games, exercises and analysis or as in this case the explanatory text of the lesson. In this case you indicate that you have read the text by clicking on the window. If there are some moves in the example, you must play through them before continuing to the next example. A link “Next >>>” to the next example is displayed at the bottom of the window and you will see an indication in the task window that you have completed the current part of the lesson. Finally there is the console window. This window allows you to discuss the examples with the trainer and other students. When a student completes a lesson another small pop-up window is displayed indicating that the lesson has been completed. The student can at any time check his progress either by selecting lessons mode or progress mode. In lessons mode the lessons windows shows completed lessons in green and the contents window shows the details for each exercise or example as shown here. Here we see that the student has completed the examples successfully and achieve a 100% score. The buttons at the bottom of the window allow him to return to the lesson and continue in case he hasn’t completed it. In this article we have taken a look at some of the general features of the user interface of Chess for Networks and the process used for assigning lessons to students and how students complete the lessons and check their own progress. Although dealing with theoretical lessons is perhaps the simplest interaction between the trainer and the student this article should give you a glimpse into the possibilities offered by Chess for Networks. Nevertheless we have just barely scratched the surface as we have not had a look at assigning and solving exercises, playing games and tournaments etc. And we have only had a brief look at the vast possibilities offered to the trainers by the trainer’s module. Chess for Networks is perhaps the most advanced training system available and I will most certainly come back to this interesting system in later articles.